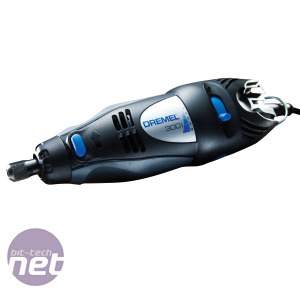 Dremel’s rotary tools, which are made by Bosch, have made quite a name for themselves, not only in modding circles, but all DIY-related areas. They’re considered robust, easy to use, well-made, and Dremel’s list of available attachments and accessories is nearly endless. The latter point is a boon, as attachments such as the Flexible Shaft make detailed tasks such as engraving far easier. 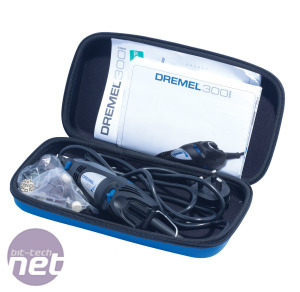 The Dremel 300 is Dremel’s mid-range rotary tool range, and the Dremel 300-30 that we review here indicates that it includes 30 accessories. A more expensive set, called the 300-1/55, includes additional items, including Dremel’s Flexible Shaft attachment, for around £60. 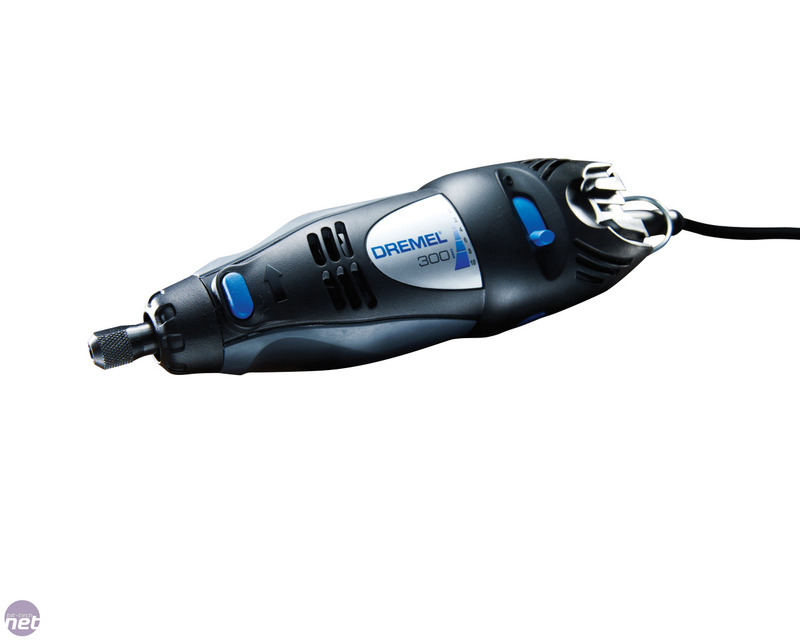 The Dremel 300 has the same 125W motor as the cheaper 200-series but includes a better hand-grip for detail work. It also sports a more granular speed range. The more expensive 4000-series offers an even greater speed range and significantly more power at 175W, but it's over 100g heavier meaning the 300 series is probably best for more detailed work if you don't want to fork out for its Flexible Shaft. 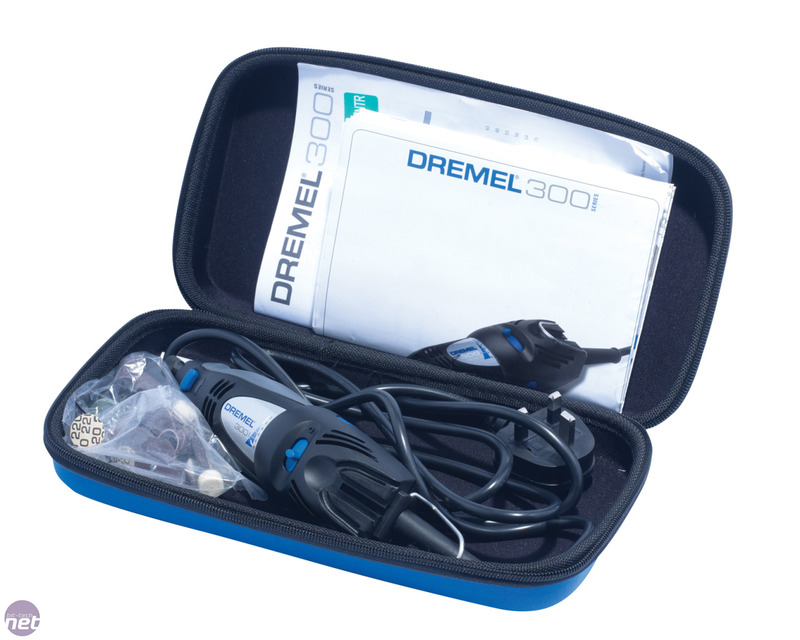 The Dremel 300 includes a semi-hard carry case that might be more compact than the Everise rotary tool other tools on test, but doesn’t offer the same protection against knocks. Unfortunately, there are no internal pockets in the carry case for the accessories either, so they’re left to rattle around inside and bash against the tool itself. A dedicated case or pouch would have been a good addition (the more expensive 300-1/55 includes this) – as it stands, you need a separate small box or strong bag to house the accessories. Thankfully, there’s plenty of spare room in the included case to accommodate this. The 30-piece accessory set is mostly devoid of engraving tips, with just a 2.4mm cutting tip included in the box; it also lacks any bristle brushes, which is disappointing. However, the range of accessories ticks most other boxes. There are two grades of sanding bands – 60-grit and 120-grit, with two of each in the case – as well as 180-grit and 220-grit sanding discs. Each of these components stood up well to punishment, even when dealing with thick acrylic sheets. Only one silicon carbide tip is included in the way of grinding stones, but it too was a glutton for punishment, retaining its shape even after tackling our steel case. A slightly odd inclusion is that of some large heavy-duty cutting discs. Five are included with the Dremel 300, but these are overkill for a product that’s aimed at more detailed work. They’re able to handle most materials, from hardened steel down to plastics and wood, but as they’re thick and ungainly and didn’t lend themselves to cutting small, neat holes. The smaller cutting discs included with other rotary tools are better at cutting fine holes. Also included are several sizes of polishing wheels, and 2.4mm and 3.2mm collets, with the latter providing compatibility with each of Dremel’s head accessory sizes. If you own a corded Dremel, chances are it's the 300. We take a look at it's successor. We've got another Dremel attachment on test - this time a dedicated router table.